MERRYFIELD COVE COTTAGES - The Perfect Place to Unwind. 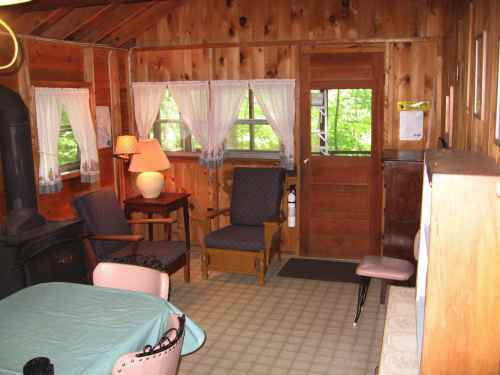 At Merryfield Cove we offer summer cottage rentals, by the week. Please call, E-mail, or write to our address below. 2017 rates. 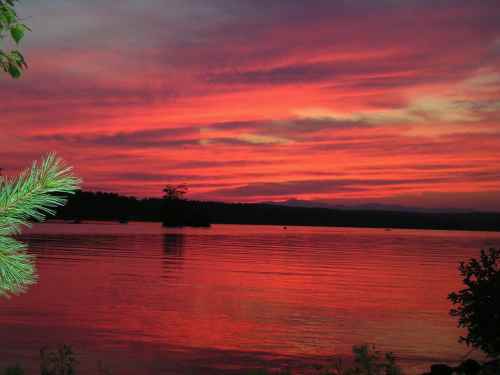 Our Four Classic Maine Housekeeping Cottages are nestled among tall pines on the eastern shore of Highland Lake, a clean lake four and a half miles long and almost one mile wide. 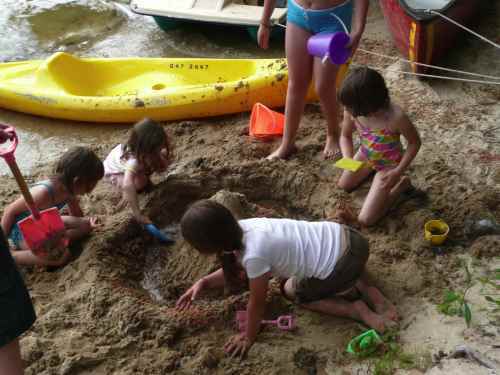 A private sandy swimming area slopes gently into the lake, an ideal spot for young children. Our sunny lawn, with its view of Pleasant Mountain, is a favorite place for family games, or for just relaxing, reading a book, and watching hummingbirds sip nectar from the flowers. Merryfield Cove is the perfect place to unwind. Kids love this place & parents relax - a real family vacation! Rowboat, canoes, a pedal boat, kayaks, and WI-FI are all included FREE. Guests who bring their own boat can moor it at our dock. Excellent swimming with easy entry, Clean water, Sandy bottom, and swim floats. We also provide picnic tables, lawn chairs, hibachi grills, and a campfire for toasting marshmallows. You will also find swings, a teeter-totter, and equipment for horse shoes, volleyball, and badminton. At Merryfield Cove, the fishing, swimming, loon watching, and nature watching are excellent. The cottages are clean and well equipped. 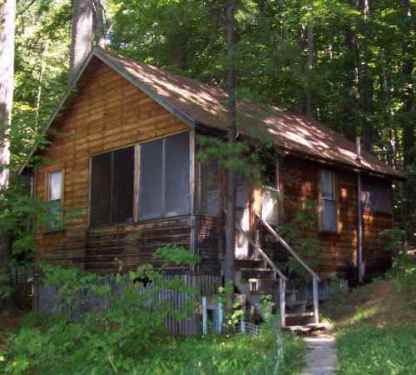 Each cottage has three bedrooms, (one has two) a bathroom with hot shower, a fully equipped kitchen, town water, a wood stove or fireplace, and a screened porch. 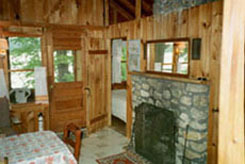 Each cottage has a queen sized bed. We provide pillows and two blankets for each bed. Guests need bring only their own linens, towels, and food. Our lovely Guest House Apartment is also available for weekly rental. Less rustic than the cottages, this roomy, heated apartment, which overlooks the lake, is located on the first floor of a private wing of the Main house, with its own private entrance, a large screened porch, and parking. In the bedroom a queen size bed is supplied with pillows and two blankets. In the living room, where there is a cable color TV, a trundle bed opens into two twin size beds. The bathroom has a tub/shower, and the well-equipped kitchen is sunny and cheerful. We are located one hour from the Maine coast and less than an hour from the White Mountains of New Hampshire. A scenic 18 hole golf course and tennis courts, both open to the public, are just up the hill at Bridgton Highlands Country Club. There is excellent hiking, walking, and bicycling in the area. Main Street, in the village of Bridgton less than a mile away, offers a variety of services, stores, antique shops, a movie theater, and restaurants. The Bridgton-Lakes Region Chamber of Commerce Information Center can provide information on many other activities in the area: a boat trip on the Songo River Queen, canoeing on the Saco River, outlet shopping in North Conway or Freeport, a visit to a glass museum or a historic house, scenic railroad rides, parasailing on Long Lake, an evening at historic Deertrees Theater, and much, much more. Click here for more pictures and our 2017 rates and terms. For more information please call Merryfield Cove Cottages at (207)647-2847. For your convenience, you can also write to us or E-mail us for more information.